A number of factors can cause puckering and tunneling of a premask or application tape laminated on a screen printed vinyl graphic. These factors fall into three broad categories: environment, material processing and product selection. Controlling your plant environment and your processing are certainly important. High humidity causes many tunneling and puckering issues. When the humidity is high, the paper tape absorbs the moisture and it grows, resulting in the tape pulling away from the printed vinyl. Problems can also occur when a plant changes from air conditioning to a heating cycle. While humidity is a common problem during the summer months, temperature is frequently a factor in the winter. When temperatures in a plant are colder, the adhesive on the premask become stiffer and does not flow out so readily over the surface of the decal as when plant temperatures are warmer. Without proper adhesive flow out, the tape may not stick adequately. Processing is also critical. Before the screen printed decal is premasked, the ink must be thoroughly cured. Inadequate curing may cause the premask to release from the print. Or in storage, the bond between the tape and print can grow unacceptably. Neither situation is desirable. In screen printing, laminating is the recommended method for applying a premask to a print. 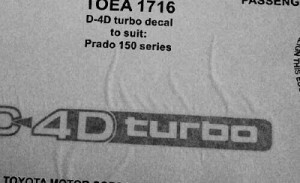 Too much unwind tension in the laminating process, however, will stretch the paper inducing mechanical stresses in the tape. As the stretched tape returns to its original state, the graphic can curl as well as pucker from the print. If you are have an issue with puckering or tunneling, application of a little heat (100⁰F or 38⁰C) when laminating the tape to the graphic can cause the adhesive on the application tape to flow out better and create a better bond to the graphic. Of course, you must have a laminator with a heated roller. The most important factor, though, is material selection – selecting the right tape for the application. In some cases, a standard weight paper application tape will work as a premask for printed decals…sometimes but, not always. Standard paper application tapes are formulated for sign shop applications, not for screen printing. 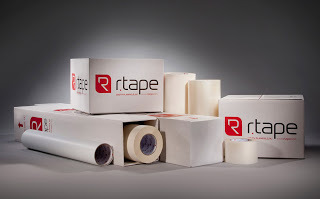 RTape has developed a series of premasks designed specifically for screen printed graphics. These premasks utilize a heavier, more stable paper facemask with a high concentration of latex saturant. Because heavyweight papers have more saturant, the tape absorbs less moisture, even when humidity is high. Standard weight paper tapes have a lower saturant concentration. When the humidity is high, the paper absorbs moisture and the paper grows. For screen print applications, RTape has developed a series of heavyweight paper premasks. Screen print premasks also have a heavier coat weight of adhesive. This is important for any screen printer printing with UV inks. UV inks are 100% solids. What that means is that 100% of what you print on the substrate stays on the substrate. This heavy deposit of ink creates a textured surface. To adhere to the print, the premask adhesive must flow into the valleys of the texture. If it doesn’t, the tape will pucker. The hand of the paper used in making the premask is also critical. Some papers have a softer hand than others. “Hand” describes the suppleness of the sheet. Paper with a harder hand is not sufficiently malleable to flow with the texture of the print. Stiffer sheets are prone to tunneling and puckering. The final factor affecting the performance of a screen print premask is the concentration of RLA® additive in the adhesive. RTape’s 4760RLA and 4775RLA are two premasks which will adhere well to smooth release liners. Pressure sensitive embossed release liners, by comparison, are challenging. For these type of films, RTape recommends use of it 4761RLA, which features a much higher concentration of RLA® additive.